Peter Cushing returns as Van Helsing in Hammer's rather confused vampire film. From Universal R1 Hammer Horror Series boxset. In 1960 Hammer were on a roll, their gothic horrors had proven incredibly popular around the world and since the Frankenstein series already had a sequel in Revenge of Frankenstein (1958), pressure was on Hammer to produce a sequel to Horror of Dracula (1958). The first draft, written by Jimmy Sangster and known as Disciple of Dracula concerned a heroic character known as Latour who travelled around destroying vampires, and had two visiting English girls as the film's heroines. However, Hammer producer Anthony Hinds did not like the story and had it substantially re-written. Many of the aspects from Disciple of Dracula would later be used in Hammer's Kiss of the Vampire (1963). Marianne Danielle is travelling to teach at a finishing school in Transylvania when her coach is mysteriously sent on without her, and she is left in a remote village. The local Baroness Meinster arrives, raising the fear of the townspeople, and offers Marianne a lodging for the night in her castle. On arrival she discovers that the Baroness has a son chained up in a remote room, and allured by him she gets the key to unlock him, but it soon emerges that he is a vampire and now freed he is able to start a new reign of terror. Meanwhile in the town, Dr. Van Helsing (Peter Cushing) has been summoned to investigate and heads for showdown with the disciple of Dracula. 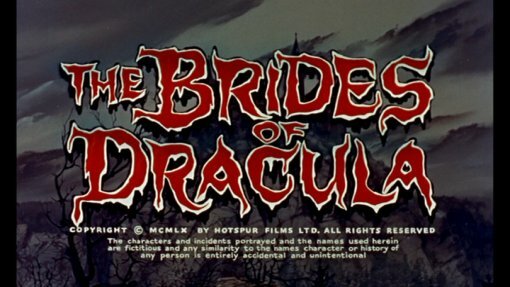 Unfortunately, Brides of Dracula did not gain from the rewriting process and suffers from dozens of plot holes and flaws. The opening sequence is especially confusing, with a mysterious character (actually Latour from the Disciple script) bribing the coachman to abandon Marianne yet seemingly having no motive to do so with no connections to either her or the Countess and he never appears again in the story. As in Horror of Dracula (1958), Van Helsing often talks of the 'cult of the vampire', but we never see any hints of this (none of them obviously thought to rescue Baron Meinster despite his wealth surely being a major influence to their cause) or have any notion that there are other vampires operating in the area - indeed Van Helsing seems to have been summoned based entirely on a loose suspicion, as the vampire attacks do not begin until he arrives. The theme of a vampire cult was much better explored in Hammer's far superior Kiss of the Vampire (1963). The film further frustrates by abandoning the vampire lore of its predecessor Horror of Dracula (1958) as women can become vampires with a single bite and the vampires can turn easily into bats. That is not to say that the script is without merit however - the Baroness is a mysterious and well presented character and it takes a while before we can decide whether it is she, or her son, who is the vampire; while the sight of a vampire digging out of a grave is a particularly eerie sight. However, the film's flaws do become very distracting and unfortunate since many of them could easily have been addressed. Fortunately, the film has a wonderful ambience. Dracula's castle in Horror of Dracula (1958) looks positively spartan compared to the Meinster castle with massive griffins on the staircase and all sorts of elaborate decoration creating a really over-the-top gothic feel and giving the film a fairy-tale ambience. Macolm Williamson was a very occasional Hammer composer provides an interesting, if rather repetitive soundtrack. Peter Cushing was fast becoming one of the big names in horror having already appeared in half a dozen Hammer horror films in the late 1950s. Here he returns as the Van Helsing character of the original Horror of Dracula (1958) with a similarly kind and dramatic nature, he gives a good performance with a stand-out scene towards the climax. Lesser known British actor David Peel makes a handsome and equally charming and menacing Count Meinster, while Martita Hunt (Miss Havisham in David Lean's Great Expectations (1946)) looks equally good as his mother. Yvonne Monlaur looks rather unimpressive as Marianne Danielle and her French accented English sounds confusing aside the proper English tones of the Translyvanian villagers. Miles Malleson steals the show as usual in a small role as a doctor, his typically eccentric mannerisms make for some of the best scenes in the film. The first real failure of Hammer's gothic horrors (Hound of the Baskervilles is often derided for its lack of 'mystery' but is still a solid film), Brides of Dracula has some good direction and a typically strong Peter Cushing performance but has a muddled plot that really does distract from the atmosphere. Of interest to Hammer and Cushing fans but not recommended. Anyone famous in it? Peter Cushing - Hammer favourite, best known as Van Helsing and Baron Frankenstein. Directed by anyone interesting? Terence Fisher - the biggest name in Hammer's gothics who directed most of the Frankenstein films. Is it scary? The grave rising scene might raise a scare, but otherwise no. Of interest to Hammer and Peter Cushing fans but not recommended. Good soundtrack? A decent although repetitive soundtrack. The picture quality is very good with strong colours, some mild grain throughout. Audio Original English mono - Dolby Digital - sounds fine. Subtitles English HOH, Spanish and French. Cuts? Believed to be fully uncut - the print includes an extended staking scene cut from American theatrical versions. Print used is English language. A good Peter Cushing performance and a good looking film, but let down by a confused script. Not recommended. A strong and colourful print of the film and good audio. Complete lack of extras. Find our reviews of other Hammer Films. Hammer Horror Series Boxset - information on the rest of the set. All text in this review written by Timothy Young - 5th September 2006.